Set up custom villager shopkeepers that sell exactly what you want them to sell and for what price. 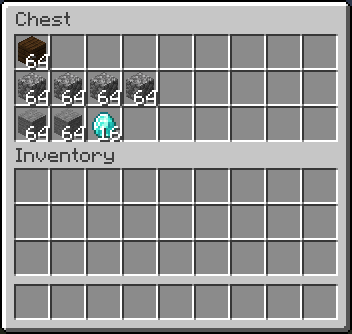 You can set up admin shops, which have infinite supply, and you can also set up player shops, which pull supply from a chest. It will also prevent any other trades with non-shopkeeper villagers, if you want it to. 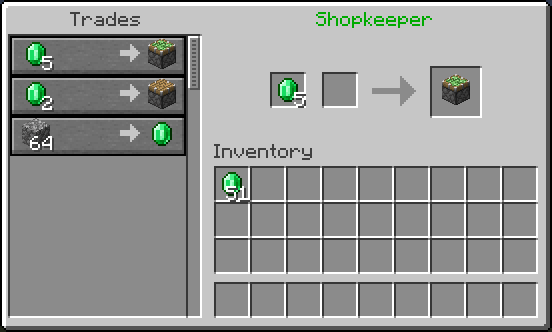 Easily create villager shopkeepers, trading the items you want them to trade. Admins shops with infinite supplies. Player shops which pull supplies from a chest. Different types of player shops: selling, buying, trading, and selling books. Various supported mob types to represent your shopkeeper, sign shops, and citizen (npc) shops. 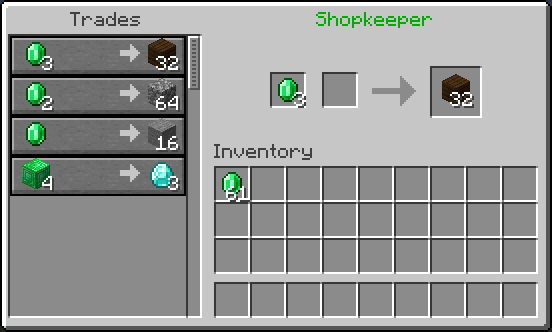 Shopkeepers supports the latest versions of Bukkit / Spigot. Note that this plugin is created to work with CraftBukkit (or alternatively Spigot). Bukkit does not have an API for some of the things necessary to make this plugin work. This means that other server software (Tekkit, Forge, Cauldron, etc.) will not work with this plugin. Other CraftBukkit or Spigot derivatives/forks might work, but are not officially supported. So if you run into issues while using those, try to reproduce your issue on a fresh and up-to-date Spigot server first. I am looking for someone to make a video tutorial and plugin introduction (in english) that is up-to-date with the latest changes (v2.6.0+) and briefly shows the setup for the different types of shopkeepers (admin and player shop types). If you have created such video tutorial(s), consider letting me know! This plugin uses bStats to collect anonymous statistics, which helps determining how many servers are using the plugin, which minecraft versions it is used with the most, and to which degree the different features are used. Common information: The number of servers using the plugin, the number of players on these servers, online mode, minecraft version, plugin version, core count, system arch, operating system, server country, java version. Shopkeepers specific information: Usage of various related plugins (Citizens, Towny, WorldGuard, Gringotts, other Vault economy plugins), number of shops, whether player shops are used, whether certain features are enabled in the config (ex. world-guard/towny compatibility, citizens shops, instant saving, colored names, chest protection, removal of inactive shops, tax rate, strict item comparison, purchase logging, disabling of other villagers, ..), the number of worlds containing shops. You can disable bStats for all plugins on your server by editing the file plugins/bStats/config.yml, or alternatively disable it only for Shopkeepers by setting 'enable-metrics' to 'false' inside Shopkeepers' config. A list of known potential issues of the latest version of Shopkeepers can be found in the wiki: This documents differences between Minecraft/Spigot versions, and existing Minecraft/Spigot issues related to Shopkeepers. If you run into an issue, check if this list already contains and maybe offers information on how to handle it. Submitting a ticket is the best way to get help or report a problem with the plugin. Check if there is already another ticket for your issue. The latest versions of Spigot and Shopkeepers. No kinds of other server or client mods. Provide the versions you are using of Minecraft, Spigot and Shopkeepers. Provide a detailed description of your problem and add as much information as possible which could help reproducing the issue. If possible, include step-by-step instructions on how to reproduce the issue on a fresh Spigot server. A big "thank you" to everybody who is keeping the motivation up through donations! Want to help? Looking for a documenter! The less I have to do myself, the more time I have to write plugins. Therefore I am looking for someone who would be willing to get involved in the project. That could for example mean: Keeping the documentation (the wiki) up-to-date with plugin updates, improving the existing documentation, or help managing issues and answering to questions of users. If you are a programmer with experience in writing bukkit plugins, or have ideas on how you can contribute to the project beyond that, let me know as well! If you are interested, feel free to contact me via PM. I was actually already planning this! It should be in the next version. Are you running the most up-to-date Craftbukkit build? Hi I love this idea for this plugin but when I try and set up a trade it looks like its working then my friend trys trading and it says someone else is already trading when no one else is on but me so neither one of us can trade any ideas why? Thanks! I have a suggestion, maybe in the second trading slot for player shops you could configure a second currency item for more expensive trades. For instance an emerald block so instead of only being able to go up to 64 emeralds you could go up to 640 emeralds if you put a stack of emeralds in the first slot and a stack of emerald blocks in the second. Thank you for your time you put into this plugin, its really coming along! This plugin has great potential. Rather than coding it to support any one economy, I would suggest using a economy API (ex. Register). This would allow you to support several economy platforms. BOSEconomy, for example which is one of my favorites. i agree completely with you. This is exactly the plugin I was looking for. Thank you so much nisovin. i'm going to base my whole economy on this plugin if it works. 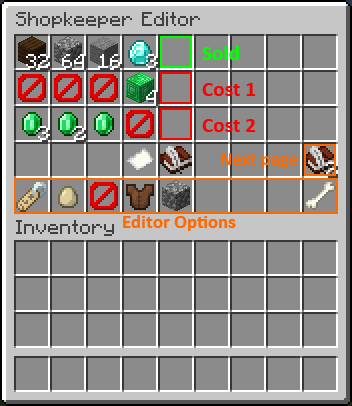 emerald based sales is exactly what i want for my server, i've disabled all the money, balance, economy stuff. i would therefore ask you, nay, beg you to never add forced iconomy integration into this plugin. as it's not needed. it would simply add bloat. i'm going to test this out right now. edit: tested and it works fabulously, this is exactly what i wanted. cheers lad. Hope iConomy and Emeralds can be somehow combined to be used as currency. 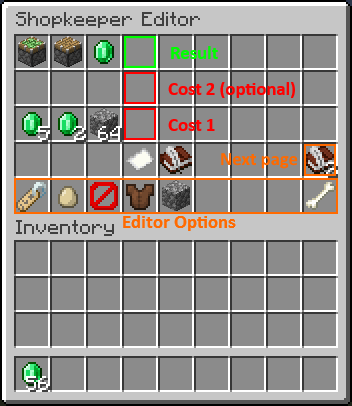 nice plugin :P can you also make it so you can pay whit an economy plugin? Thanks, Was wandering if at all it was possible to get this to work with Enderchests because I was thinking it would be really cool to sit back at your home/base and collect/add items from any where you choose! Have you updated your Craftbukkit build? Make sure you're up-to-date. Bug, Nothing in cmd window. When I use one of the villagers then exit then go back it says the villager is in use. I have to go and use another villager then go back to the one I want to access. Btw I really want to say how great this plugin is and I LOVE it. Best Shop Plugin I have seen to date. Really love using it sofar and can't wait to see what else comes from this. This is already GREAT! Possible idea to implement a currency. Have a command like /shopkeeper money set input/output [amount] or something. Do that for both the input and output. Then when the player trades with the villager. It appears as gold bars with a number on them. If the input is 5000 money. Then the gold bars would say 5k. Then when they player did the trade, he receives 5k. Could be a little tough to get working well. But you do great work. I think you can. do it. Great plugin! wow in a just a few days you have created probably the best shop system ive ever seen. Just amazing! Nisovin you are a hero. New version uploaded! The latest version has a config file that lets you modify a lot of the features, and it also has a few other changes. Delete your old config file to get the new one. I wouldn't know what to suggest for using currency plugin, but what about changing the "currency" item. MM could be used for custom coins and there are some mods also add currency. Could you make an entry in the config for changing the currency item from emeralds. It should be, but I may have forgotten to upload the latest version. Try downloading again. Having problems. The chest armor isn't showing up?